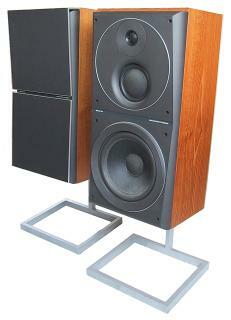 A quality loudspeaker for either floor or bookshelf mounting. The power rating of 55W made the S55 suitable for the larger and more powerful amplifiers in the range, and they were offered as the recommended loudspeakers for the Beocenter 5000 and 7002. Later on they would prove ideal for the 55W Beomaster 5000. Text copyright © Beocentral. Unauthorised reproduction prohibited. The sturdy cabinets followed the typical construction for large Beovox models of the time, with a thick wooden sides and rear panel fronted by a resin baffle. The rear panel was covered in finely textured black plastic sheet, whilst the other faces (excluding the front) were offered in teak, rosewood or white, all with a thin aluminium trim around the rear edge. The front grilles could easily be removed to inspect the drivers. Connection was by a recessed DIN connector at the rear, and the rear panel also featured threaded holes for the optional floor stands. Text copyright © Beocentral. Unauthorised reproduction prohibited.